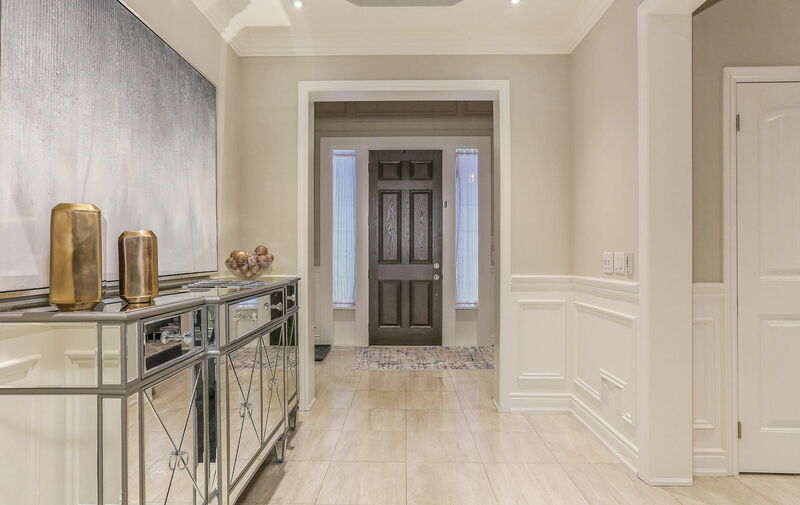 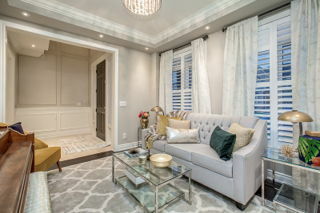 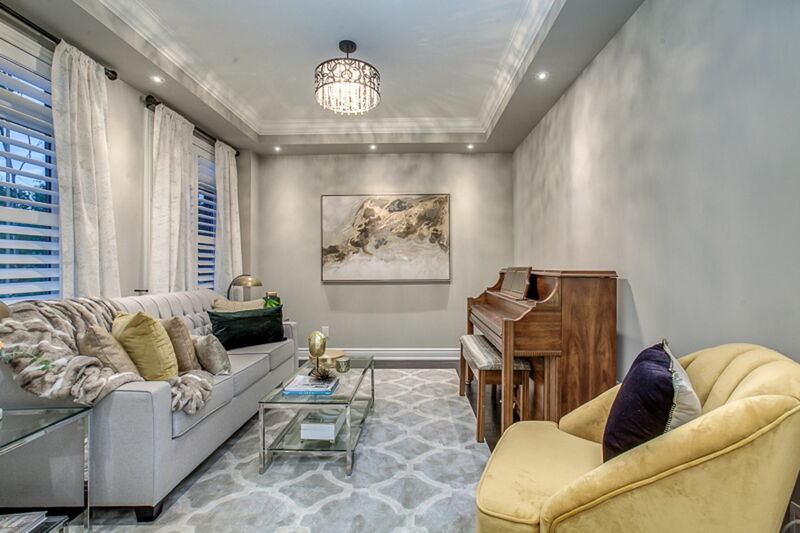 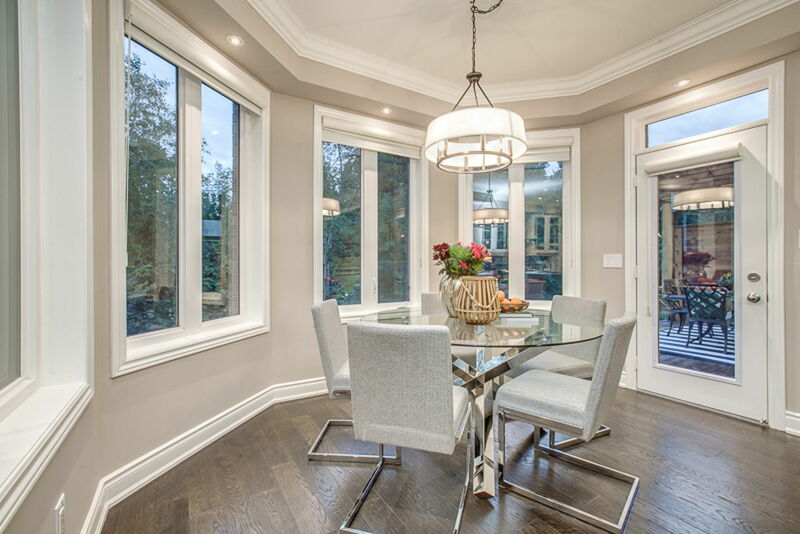 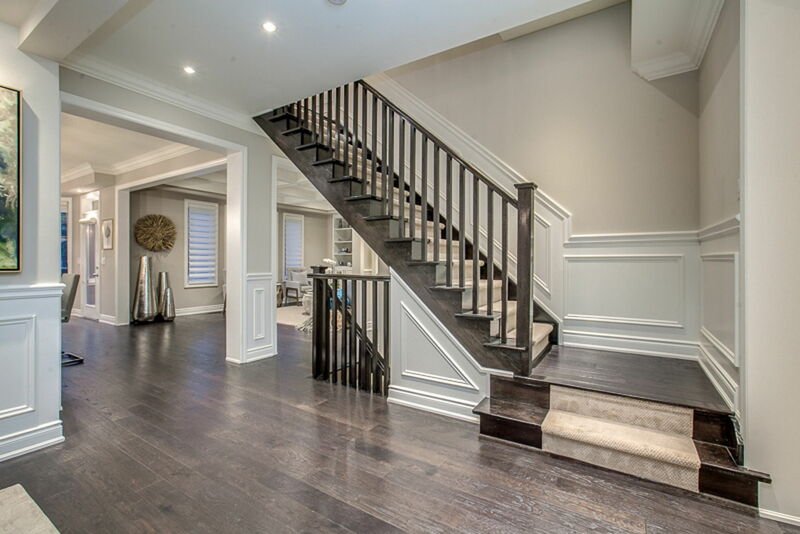 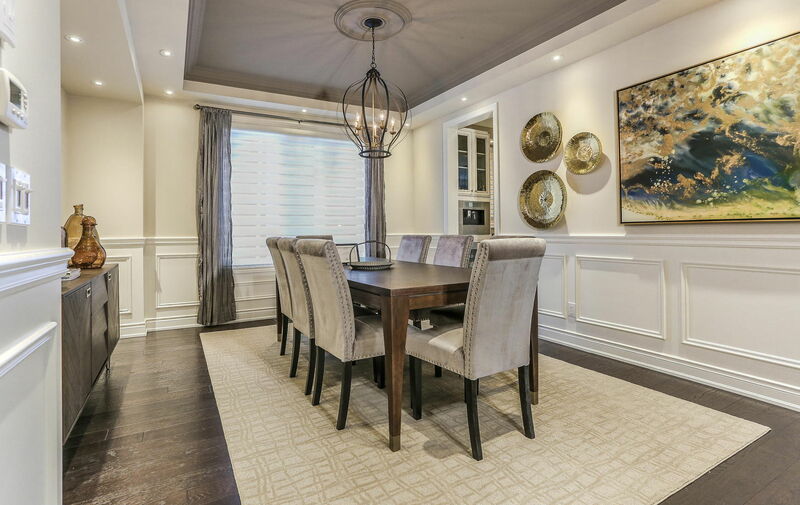 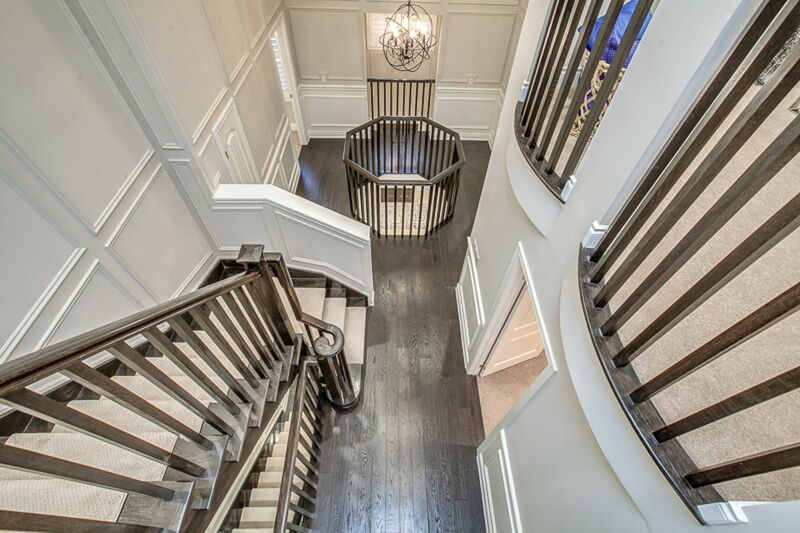 Elegantly blending traditional charm with modern opulence, and the latest in smart home technology, this meticulously detailedhome is a prized Oak Ridges find – an entertainer’s dream! 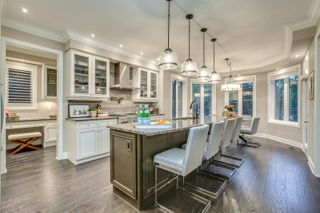 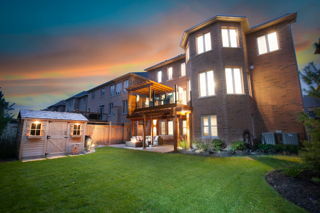 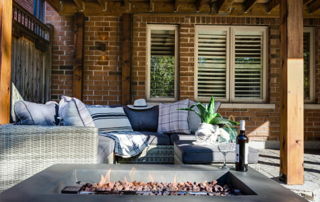 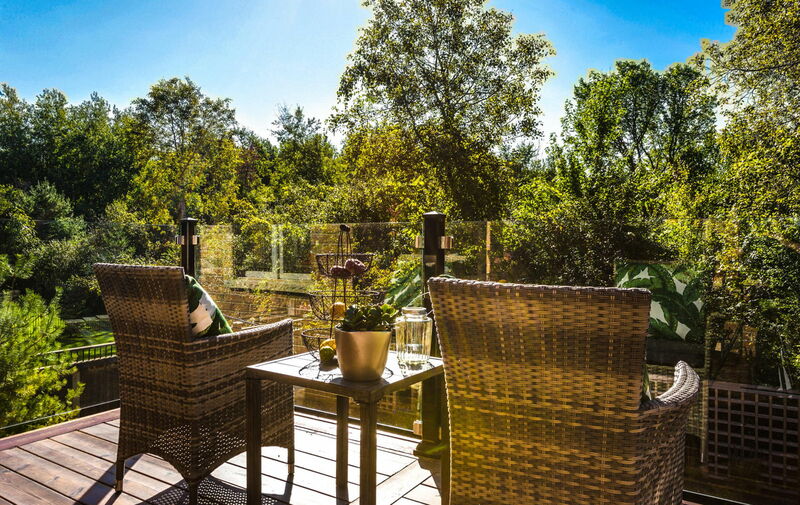 Standing three storeys tall, this home sits on a premium ravine lot,and is sure to impress, with over 6,000 square feet of living space, and a professionally landscaped backyard that backs onto aprotected conservation area, with kilometres of trails that you can walk and hike, through the Oak Ridges Moraine. 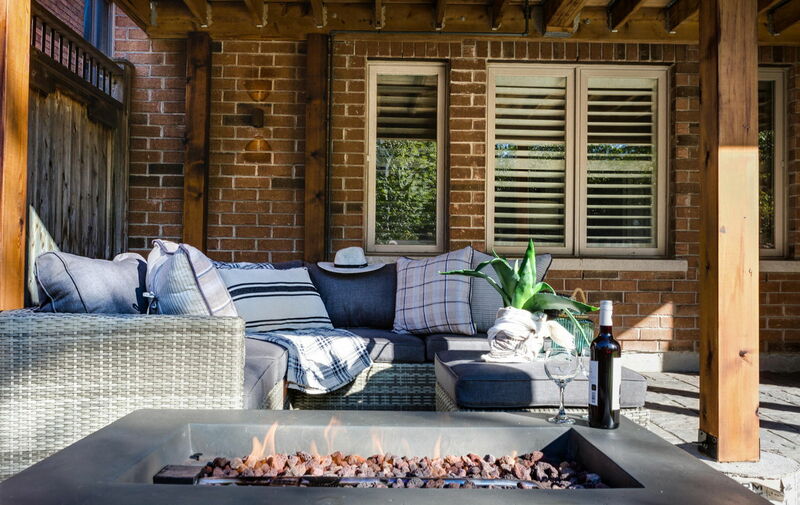 Guests are welcomed by a handsome brick exterior and pristine curb appeal. This generously proportioned residence featuresan optimal open floor plan with 4 plus 2 bedrooms, 6 bathrooms, an incredible loft, and a spectacular finished lower level, withwalk-out. 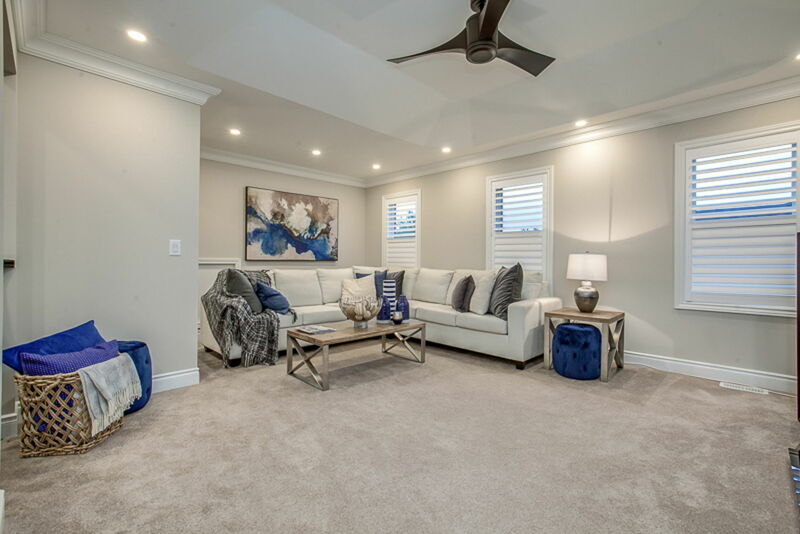 From the minute you walk through the door, you will notice this exceedingly well-maintained family home has been upgraded,with no expenses spared! 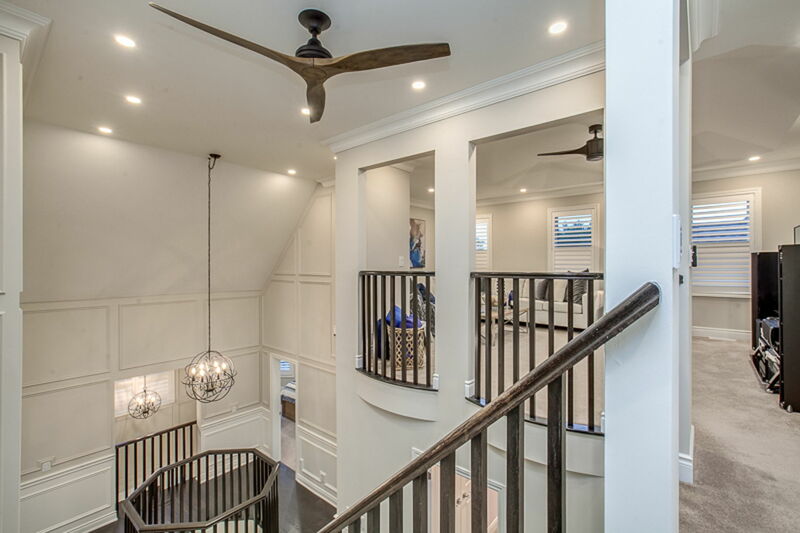 Upon entering the grand foyer, the soaring ceilings create an overall feeling of grandeur, with a view allthe way up to the third floor Juliet balconies. The entire home beams with natural light from its picture windows that are outfittedwith Hunter Douglas privacy shades and shutters, artisanal, hand-scraped hardwood floors, coupled with the generous use oftasteful and impressive crown mouldings and trim work that you will notice throughout the home.The main level boasts a gourmet, chef-inspired kitchen complete with professional grade appliances. The nine-foot centre islandwith breakfast bar overlooks the stunning upper deck and rear garden. 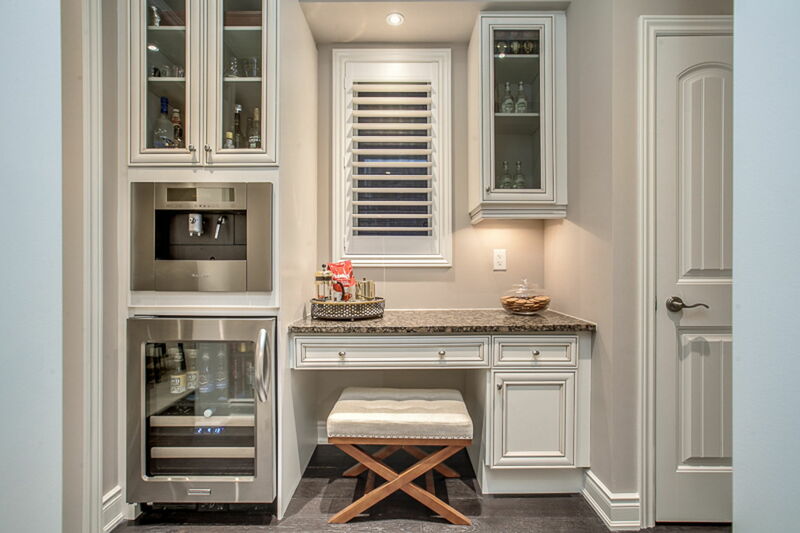 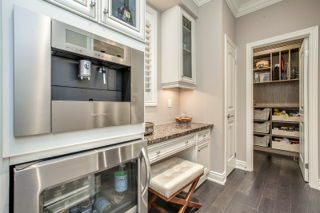 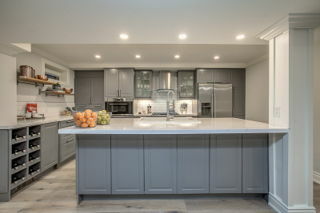 The butler’s servery, with its automated, built-in espressomaker, and organized pantry with both open and concealed storage, is essential to keeping the kitchen sociable and stress-free. 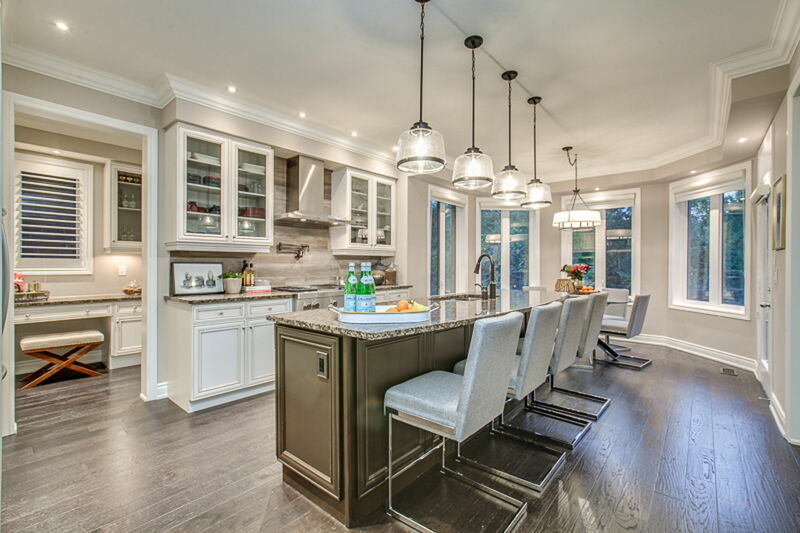 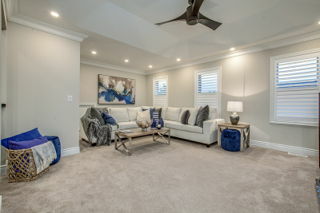 The kitchen is open to the family room with gas fireplace, coffered ceiling, and custom, built-in cabinetry, and seamlessly flowsinto the adjacent formal dining room. 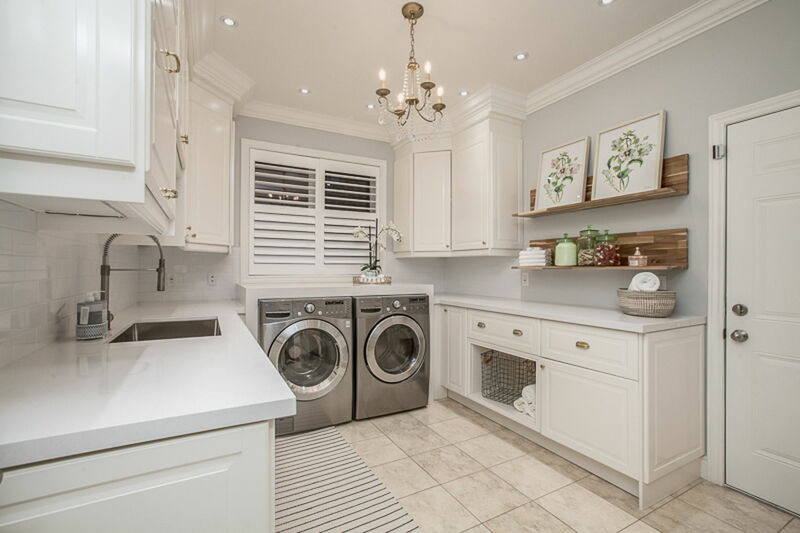 The main floor is completed with a formal living room overlooking the front gardens, apowder room, and a stylish and functional laundry room designed with a beautiful waterfall counter, and careful consideration to afamily’s storage and organization needs. 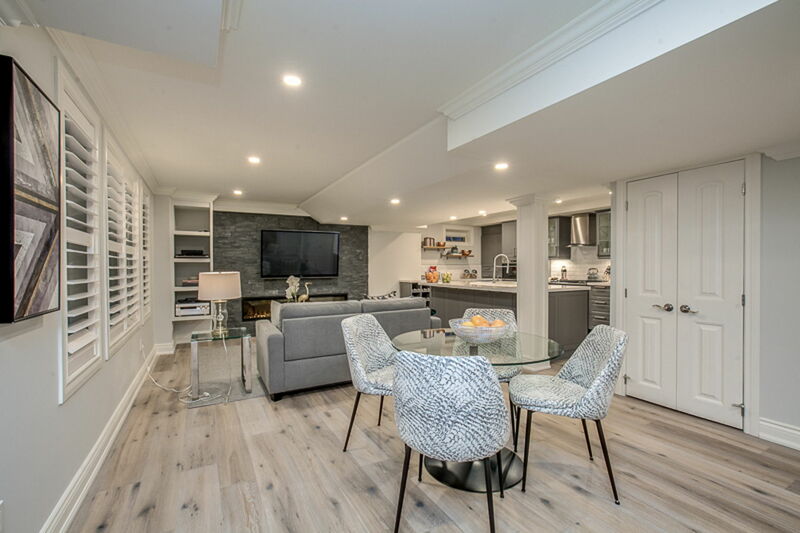 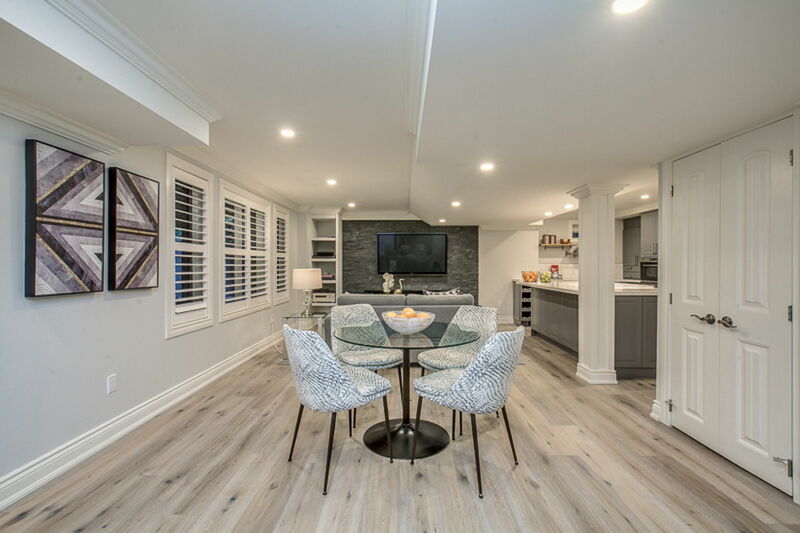 On the lower level, the living space extends into a light-filled, above ground, magazine-worthy, recreational zone, again withartisanal, hand-scraped hardwood flooring throughout. 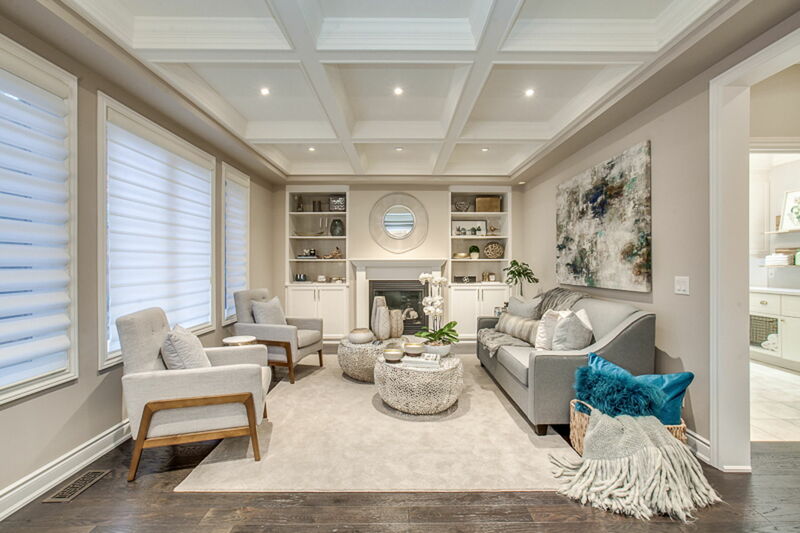 This magnificent open concept space includes a full designer kitchen, astunning stone-feature wall with a gas fireplace and 3D TV, and a walkout to the rear gardens and stone patio. 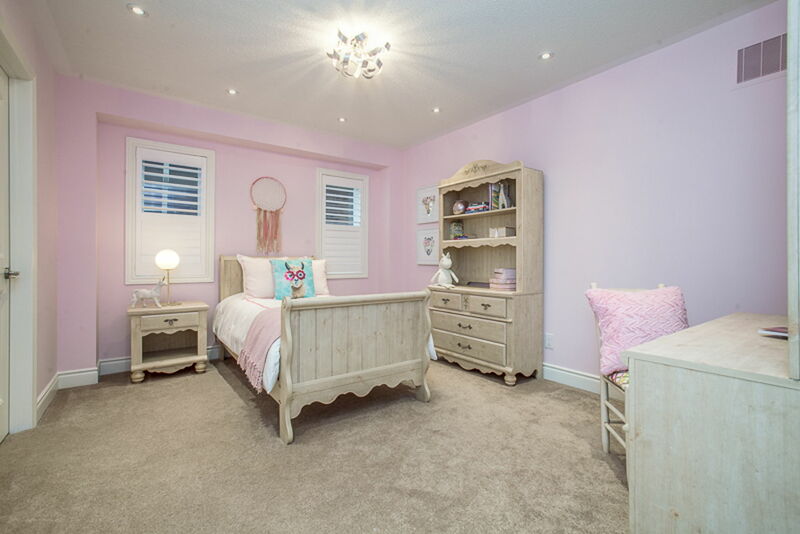 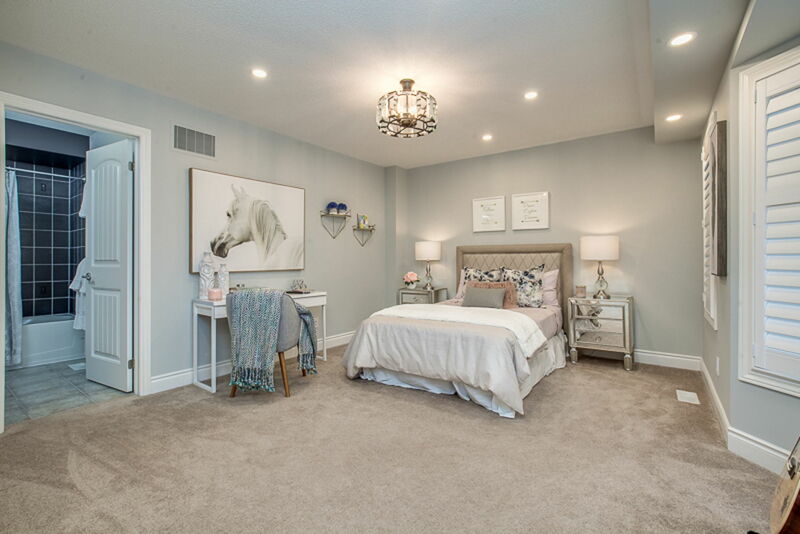 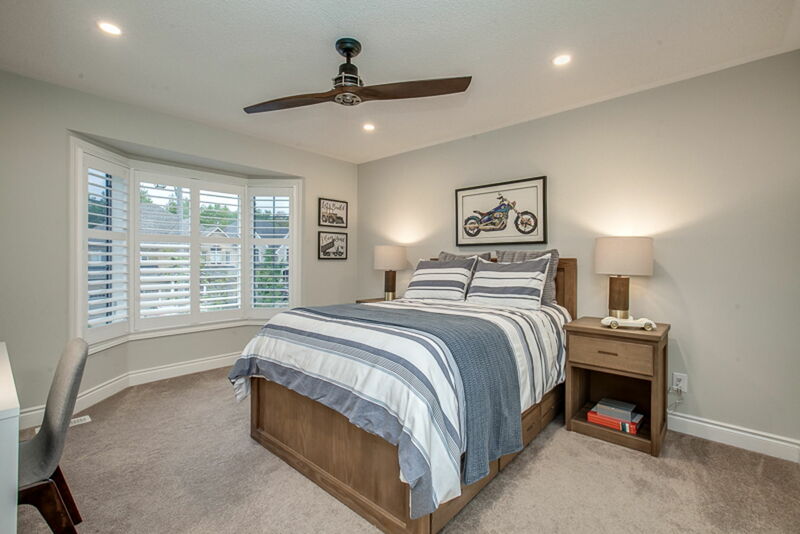 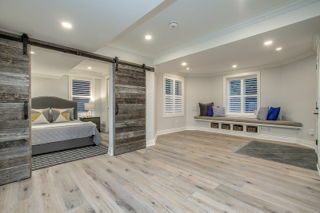 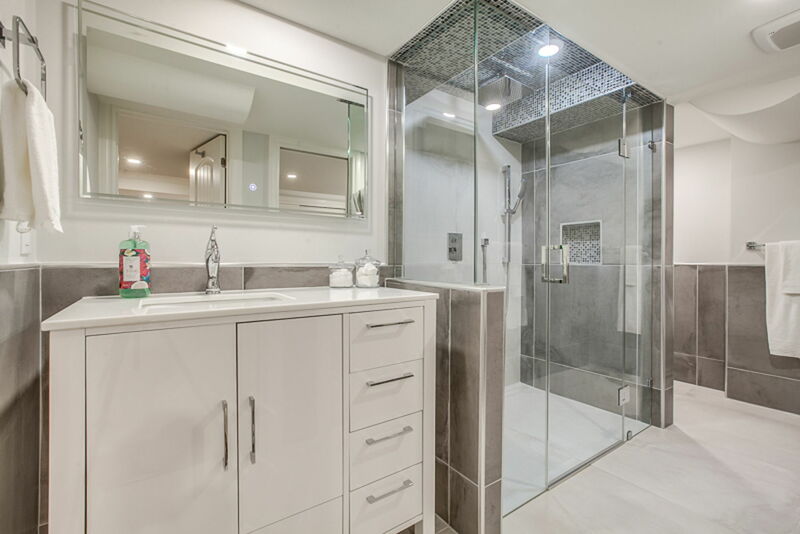 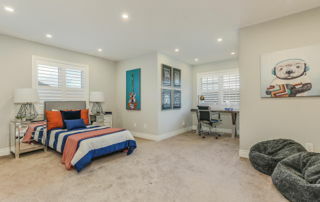 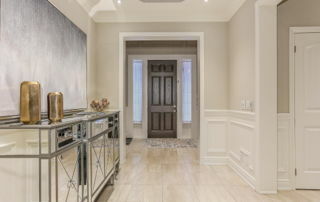 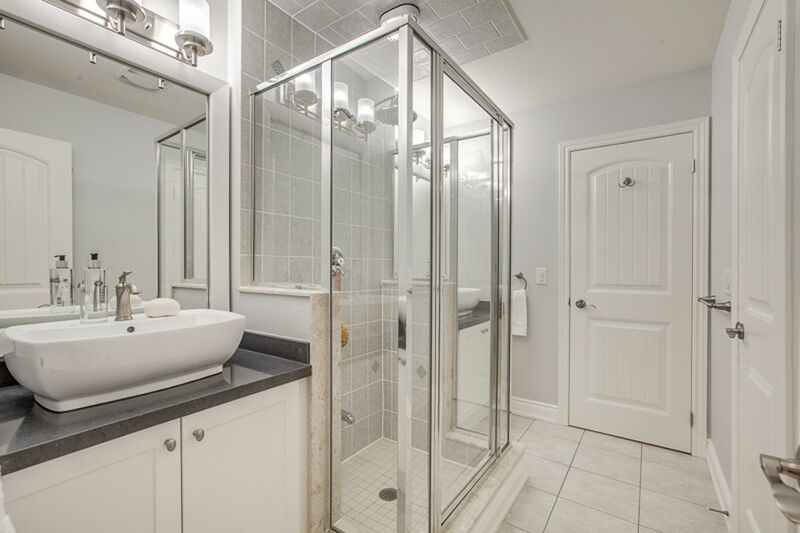 Custom Ontariobarn doors lead into the fifth bedroom, complete with an ensuite bath that is outfitted win in-floor heating providing comfort andluxury even inside the shower. 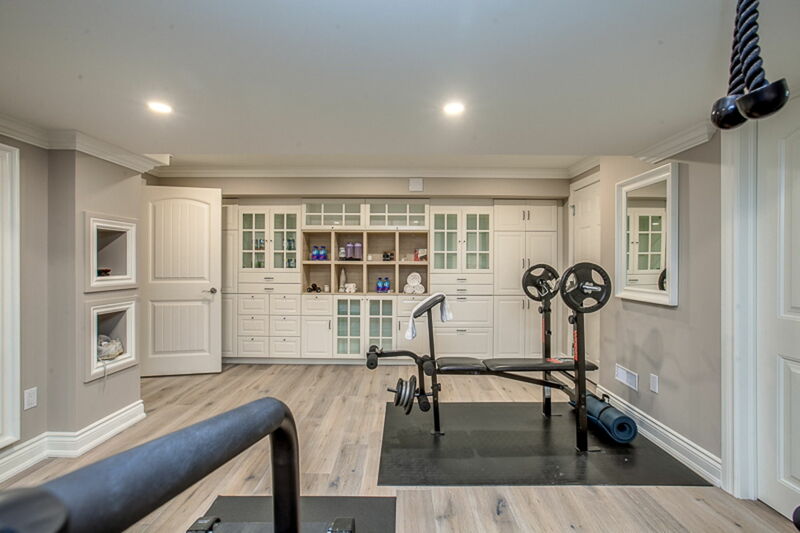 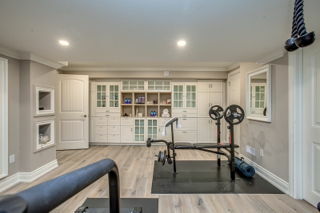 The stylish and functional home gym is designed with thoughtful built-in cabinetry and shelving,and a walk-in storage closet and cold cellar complete the lower level. 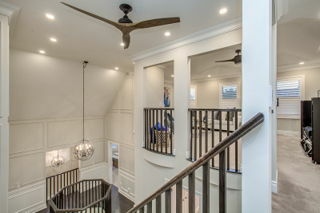 Heading back upstairs, on the second floor of the home, you will find four of the five upper-level bedrooms, starting with themaster retreat. 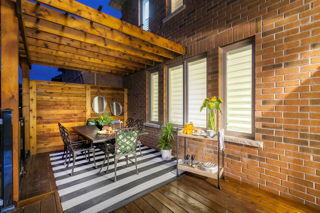 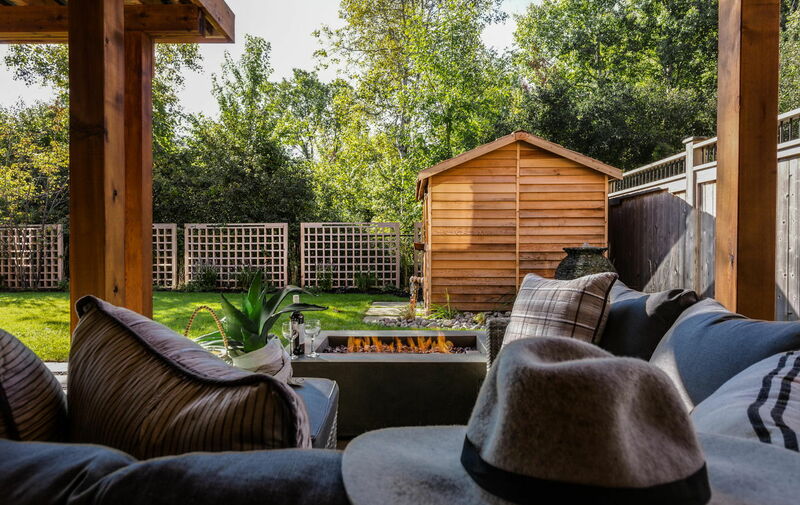 This oasis greets you with a spacious seating area overlooking the rear gardens. 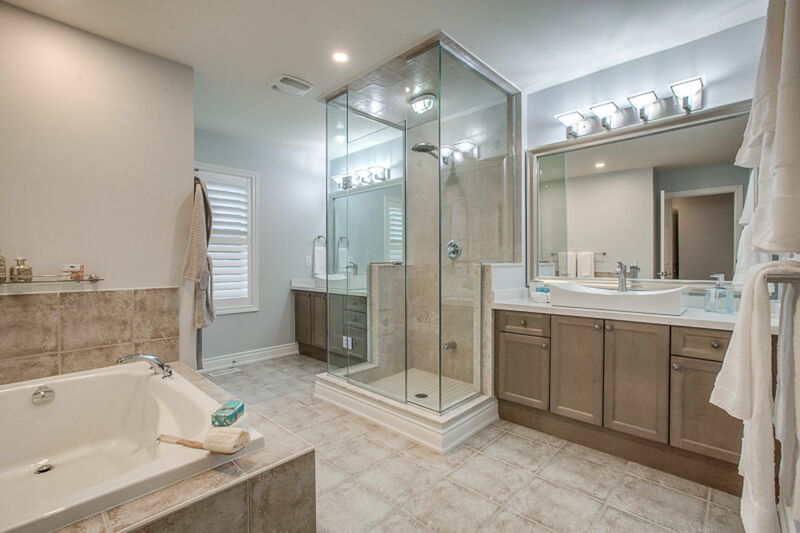 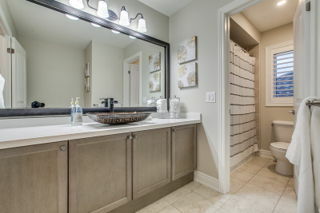 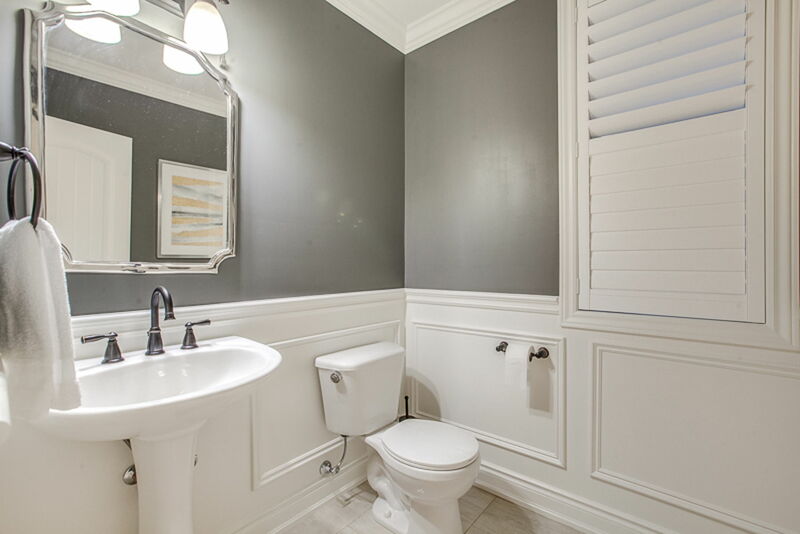 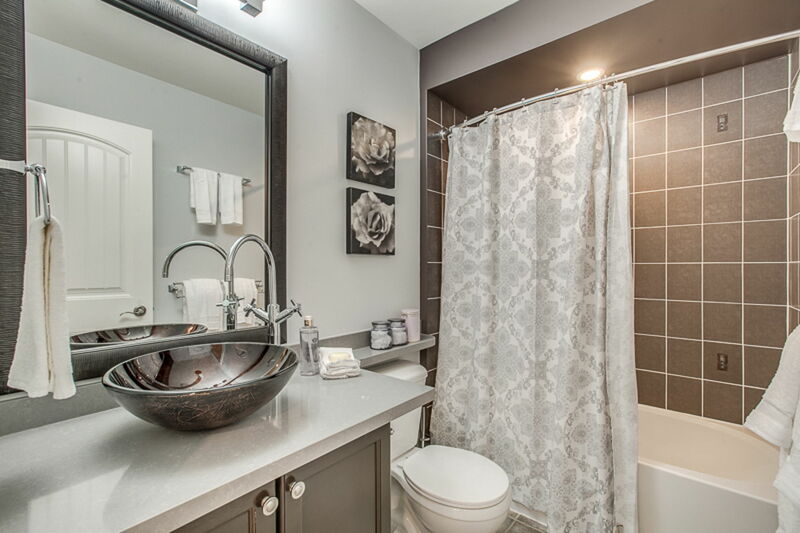 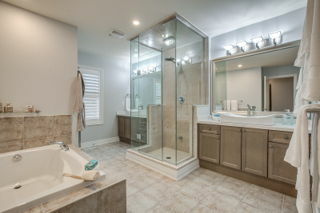 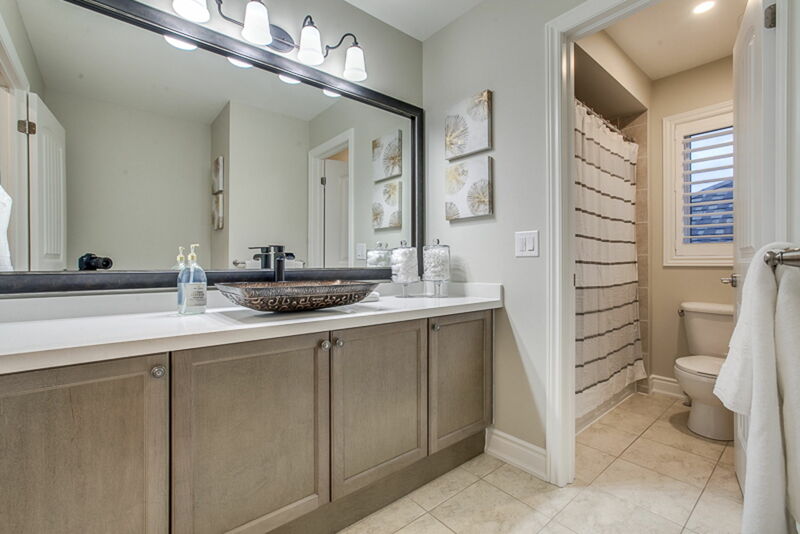 A spa-like five-piece bath withvessel sinks, beautifully appointed his and hers custom dressing room, hardwood flooring, and crown moulding make this space atrue retreat. In addition to the master, you will find three, well-appointed bedrooms, one with its own private ensuite and two ofwhich have a shared bathroom with dual vessel sinks. The spectacular loft is housed on the third floor of the home and includes acasual family and music room, as well as an additional bedroom that has been converted into a generous sized office, with a fullfour-piece bath. 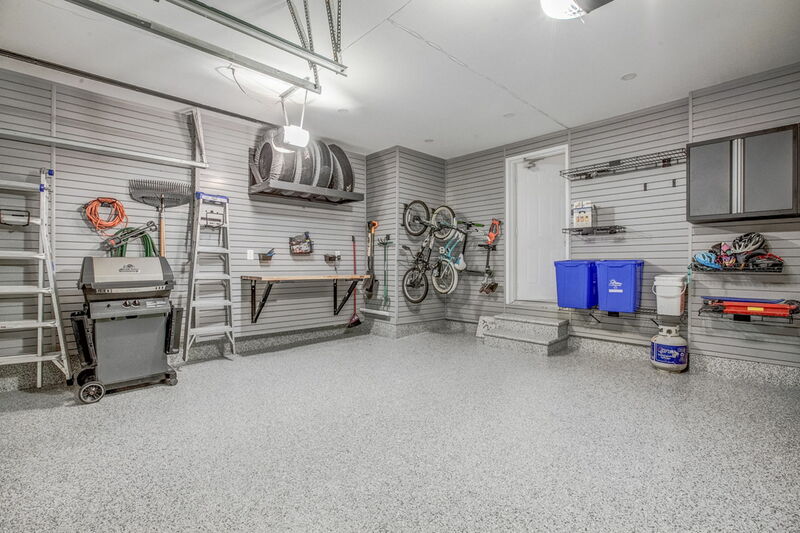 The attached, gleaming, two-car garage is further evidence that no effort has been spared to create a luxurious environment, insideand out, transformed by the design team at Garage Living. Perfect for the car aficionado, hobbyist, or outdoors enthusiast, thisgarage has stylish and durable epoxy floors, coupled with outstanding organizational features.Meanwhile, the smart backyard marries the natural beauty of the Oak Ridges landscape with tech savvy and energy-savinglighting features that can be controlled from your smartphone or within the home. Enjoy the views from the upper cedar deck offthe kitchen, with frameless glass railing and pergola with dining area; or walk out from the lower level to the interlocked patio, andenjoy a glass of wine by the natural gas fire table. 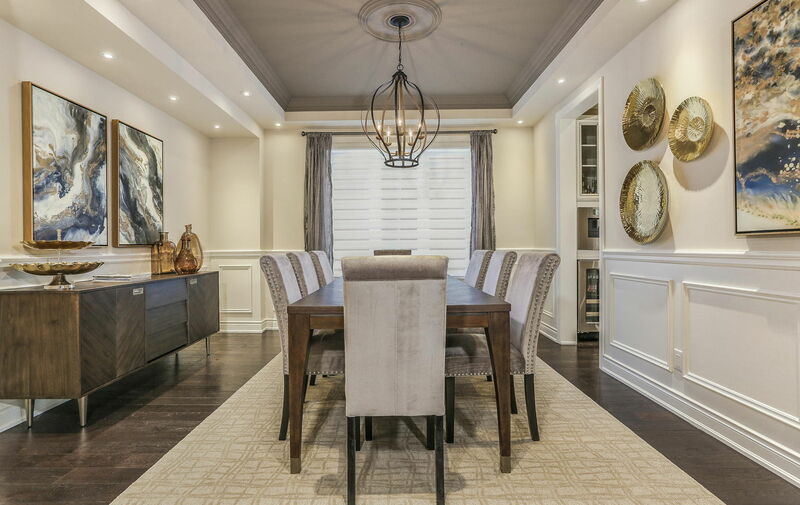 Steps to wonderful French and English schools, restaurants, and amenities, makes 44 Pheasant Drive an idyllic place to call homefor anyone looking to enjoy the serene beauty of Oak Ridges.